Angels in their flight! This is how David Livingstone described the breathtaking Victoria Falls, where five million cubic meters of water cascade over every minute during wet season. Hear the roar and see the spray upon approach. Experience the falls by light-aircraft, helicopter, microlight or ultralight. Or bungee jump over the River Zambezi, canoe amongst hippos and crocodiles, or go whitewater rafting down one of the world’s toughest stretches. 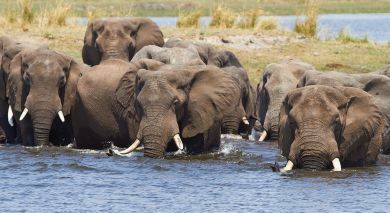 Located on the river’s banks, explore Zambezi National Park & Matetsi, home to elephant, buffalo, lion, leopard, giraffe and zebra, hippo, crocodile and iridescent birds such as bee-eaters, storks, herons, kingfisher and, fish eagles. Elephant Camp is a small retreat overlooking the Zambezi Valley, within a private concession approximately 10km from the Victoria Falls. Ilala Lodge is conveniently located close to the Victoria Falls and combines privacy, colonial style elegance and tranquility. The Victoria Falls Hotel is situated in the Victoria Falls National Park. 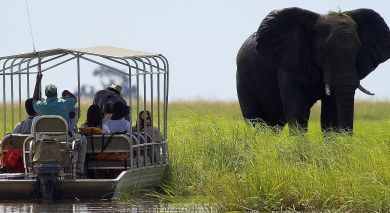 A Day Trip to Chobe National Park is a brush with Africa’s wild predators and nature at its pristine best. Known for herds of elephants that frequent the park, you can also watch up close other wild and smaller animals inhabiting the forest area and the banks of the river. The tour starts from the Kazungula border, where an experienced guide meets you and directs you to the morning cruise and a few hours of exciting game viewing. 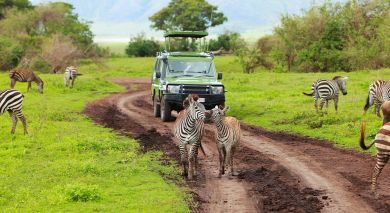 After a break for lunch, you board a safari vehicle for some more hours of an afternoon game drive through the park. The day will come to an end but not before you’ve made some unforgettable memories. Welcome to the Zimbabwe side of the Victoria Falls. The Mosi oa Tunya! The Smoke that Thunders! Get enchanted by the scenic views that tell the story of the magnificent Victoria Falls. The stillness is constantly interrupted by the rumble and roar of the waters as it cascades down rocky cliffs. The water plummets down 100 meters into a deep basin forming enormous clouds of sprays. The sprays and sun’s rays form rainbows and a glittering effect like diamonds in the skies. From miles away, the thick smoke-like clouds and the consistent rumbles fill the air. Take a walk on the islands or canoe to the base of the waterfall for breathtaking views. Ariel views from chopper rides will give you views of massive sprays of waters and rainbows. 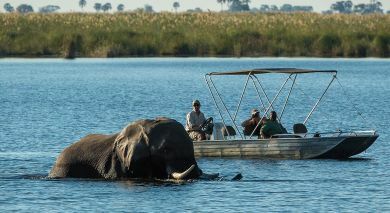 You will also spot herds of elephants, rhinos, zebras, hippos and other wild game from the islands. When David Livingstone said ‘scenes so lovely must have been gazed upon by angels in their flight,’ he couldn’t be more accurate. And you wouldn’t feel any different from aboard a chopper as you take a 25-minute flight over the Victoria Falls. The specially designed helicopters come with bubble-shaped windows that ensure picture perfect viewing and terrific photographic opportunities. Fly over the Victoria Falls and marvel at the various routes that the Zambezi has carved over the eons. Move downstream over the Batoka Gorge and watch the Zambezi River as it winds through steep cliffs. Children can feel the thrill of this activity as long as they are safely accompanied by an adult. This lazy and relaxing Sunset Cruise on the Zambezi River can well turn out to be the centre point of your African vacation. Riverside flora and fauna and aquatic creatures dot the cruise as you soak in a gorgeous sunset from aboard the cruise boat. You would want to freeze frame these moments forever. Transfers are complimentary if your hotel is within a five-kilometer radius from the jetty. Quiz the cruise skipper, who doubles up as your guide, on any queries you may have about life around the riverbed. A crew of attentive waiters and barmen ensure that your plates and glasses stay full. For an ultimate rush of adventure and wild escapade, join our full day Low White Water Rafting over the great rapids of the Zambezi River. These trips, offered from August to December, take you from Rapid No. 1 to 19 and gets your adrenaline pumping high. Our trained guides will safely guide you through the rapids and share interesting details of the geology of the area. It’s not all choppy though – there are places where the waters are calm and you can take in the beauty of the basalt rock walls, mystical rain forest and impressive gorges around the Victoria Falls. The Canopy Tour of the Victoria Falls is one tour every member of your family will love and reminisce long after your vacation is over. The majestic waterfall, unparallel in scale and beauty of its surroundings, and one of the seven wonders of the natural world impresses with its sheer magnitude. The Canopy Walk takes you through the Zambezi gorges through slides, trails and rope bridge walkways. Visit viewpoints from where the misty rainforest appears more mystical. Observe the awesomeness of the great Victoria Falls, cascading rapids and the hardwood forest of the Zambezi gorges. Bird watchers revel as the Knysna, Purple Crested Turaco (Lourie) and Peregrine Falcons flutter and fly low. Our trained guides will make sure of your safety and ensure that you have a memorable holiday experience. Clock yourself in for a fabulous experience as you take a 30-minute microlight flight over the Victoria Falls. Soar over the mighty Zambezi and get a bird’s eye view of the majestic falls. Feel the adrenaline rush you’ve long wanted, for this spectacular experience is as open-air as natural flying. The flight makes several circuits around the falls before continuing over the Batoka Gorges and moving over the Mosi-Oa-Tunya National Park. Spot some of Africa’s most feared predators when the aircraft flies low over the national park. This weather-dependent activity is more for the experience and for you to soak in the memories for posterity.